Ryfab Roof with Tusk Spare Tire Carrier?? > Ryfab Roof with Tusk Spare Tire Carrier?? Thread: Ryfab Roof with Tusk Spare Tire Carrier?? I purchased and installed the Ryfab Roof on my Trail last year and want to get the Tusk Spare Tire Carrier found here: https://www.rockymountainatvmc.com/p...tire-carrier-p. But I'm worried that the Ryfab roof will get in the way of the mount. The picture attached shows the roof that Tusk sells and not the Ryfab. The Ryfab doesn't extend down as much over the bar as the Tusk one does, but I'm afraid I might have to cut a notch out of the roof to make it fit. I know it's unlikely that anyone has this combination, but I thought I would give it a try. Thanks! What spare tire carrier is compatible with the Lonestar roof? Tusk or Factory UTV Spare Carrier? 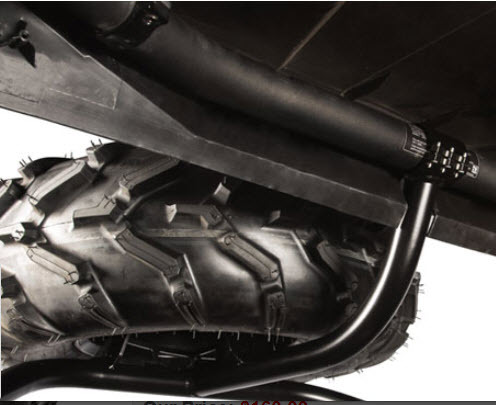 RZR Style Spare Tire Carrier...? Anyone?